Before Geoff and Jeremy moved, we had met up in Milwaukee for dinner at the Public Market. While there, we did some browsing at the various food shops and stalls that lined the market. Just before leaving, Geoff picked up a quiche to take home with plans to enjoy it for breakfast the next day. And on the car ride home, I learned that The Baron had never had quiche before. Well it was obvious that I needed to make a quiche for The Baron to try. [I should really start making a list of foods I've gotten him to try for the first time.] 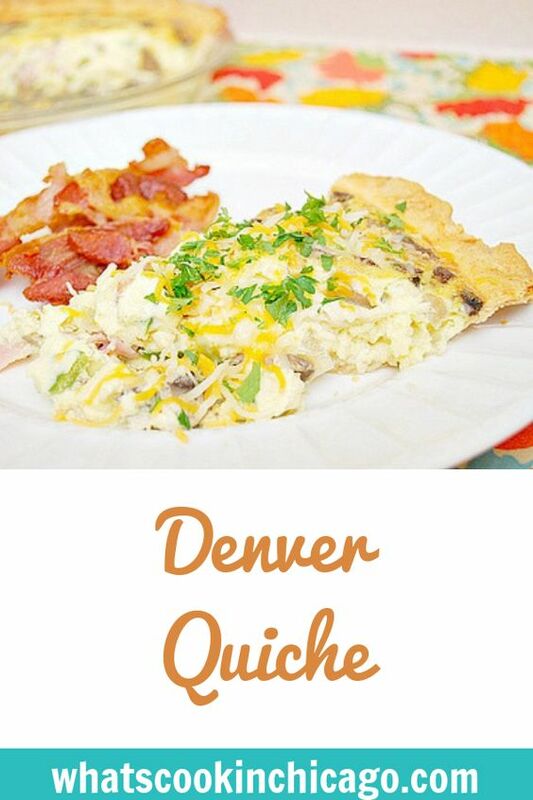 When I thought about what kind to make, I took inspiration from one of my favorite omelettes - the Denver omelette. The crust was made with gluten free flour but you can certainly use all purpose flour. If you're in a hurry or just want the convenience, feel free to use premade frozen pie crusts or even the roll out refrigerated crust. Either way, the crust will need to be par baked before using. For the filling, you can use whatever you'd like and in this case, I used onions, bell peppers, mushrooms, ham and cheese. You just have to be careful not to fill it with too many ingredients. I aim for a nice balance of egg custard and mix in ingredients... but again, adjust to your own tastes and preferences. To prepare crust, place butter in a large bowl; beat with a mixer at medium speed until light and fluffy. Combine milk, salt, and egg yolk in a separate small bowl; stir well with a whisk. Add milk mixture to butter in the large bowl, 1 tablespoon at a time, beating well after each addition. Add the flour slowly; beat just until combined. Press mixture into a 4-inch circle on plastic wrap; cover and chill for 1 hour to firm up. Meanwhile, preheat oven to 350°. Unwrap and place the chilled dough on a lightly floured surface. Roll the dough into a 10-inch circle, just a little larger than a standard 9 inch pie plate. Carefully place the rolled out down into the pie plate and form. Crimp the edges as you wish. When you're done, freeze the crust for 15 minutes so it holds its shape. Bake the slightly frozen crust in the preheated oven for 25 minutes or until lightly browned. Cool on a wire rack while you prepare the filling. Keep oven set at 350 degrees. To prepare filling, heat oil in a large skillet over medium-high heat. Add bell peppers, mushrooms and onions; sauté 5 minutes or until tender. Add the ham and sauté until warmed through. Combine the milk, cheese, salt and eggs in a large bowl, whisking to incorporate. Stir in vegetable and ham mixture then pour filling into the previously baked crust. Bake the quiche at 350° for 35 minutes. To serve, cut into wedges and garnish with parsley. This is the best combination for my personal uses and has never failed me. I purchased a majority of the ingredients at an Asian market (at less than $.99/lb) and the other ingredients marked were Bob Red Mill brand. Cornstarch was Argo brand. Whisk together the above flours and store in an air tight container. To use, measure out 140 grams for every cup called for in your favorite baking recipe (NOT yeast bread recipes.) Add 1/2 teaspoon xanthan gum for every cup used in the recipe as well to help with texture and binding. Voila! You can bake gluten free with confidence! 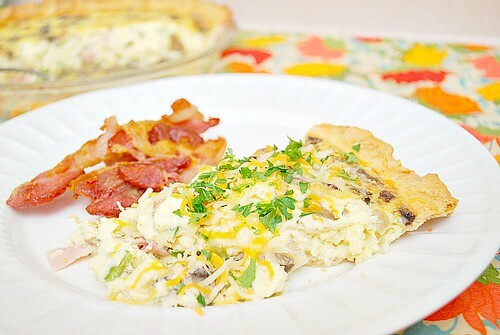 I really need to play around more with fillings for quiche. So many great omelets can be turned into quiches!